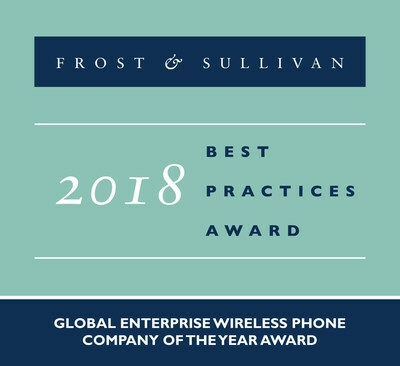 LONDON, Oct. 31, 2018 /PRNewswire/ -- Based on its recent analysis of the global enterprise wireless phone market, Frost & Sullivan recognizes Ascom with the 2018 Global Company of the Year Award for leading the market with 20% of the total wireless phone shipment and 21.7% of the revenues1. Having achieved a 14% growth in shipments, it was one of the few manufacturers to demonstrate an above-market average growth rate. Its commitment to addressing unmet customer needs, solid implementation of best practices, a distinct and innovative portfolio, tight customer focus, and strong brand recognition have helped it differentiate itself from the competition. "Ascom recognized the need to build processes and tools that deliver consistent results and hence, harnessed several best practices in handset, battery, and system maintenance, as well as compliance adherence," said Mohamed Alaa Saayed, ICT Industry Director, Frost & Sullivan "It acknowledged the need to implement successful mobility solutions and has accordingly provided full documentation, best practice material, and diagnostic tools to a wide ecosystem of channel partners, individuals, and institutions." The demanding healthcare vertical has particularly benefitted from the Ascom Mycoâ„¢, purpose-built smart devices that enable Wi-Fi, DECT, and 4G LTE communications. Its robust design is capable of withstanding knocks and drops, and this product feature greatly helps it comply with industry safety and security standards. Furthermore, the Ascom Healthcare Platform supports the integration of existing hospital systems such as electronic patient health records, patient monitoring, lab, nurse call systems, and other medical devices. The company's sustained performance has established it as a key best-of-breed wireless endpoint developer. Its customer ownership experience is among the best in the industry with multiple organizations, including hospitals, healthcare institutions, manufacturing facilities, and retail stores, reporting high satisfaction with the way Ascom solutions address their unique needs and constraints. "With more than 100,000 installed systems, Ascom has positioned itself as a vendor of the most widely-used enterprise on-site wireless endpoints in the global market. It has also made significant efforts to secure tight integration with multiple third-party solutions and provide extensive configuration and customization options," noted Saayed. "While the company has recently focused on becoming the top wireless endpoint vendor in healthcare ICT by 2020, it will continue to also cater to other industries." 1. According to Frost & Sullivan's latest Global Enterprise Communications Platforms and Endpoints Market study. Ascom is a global solutions provider focused on healthcare ICT and mobile workflow solutions. The vision of Ascom is to close digital information gaps allowing for the best possible decisions â€“ anytime and anywhere. Ascom's mission is to provide mission-critical, real-time solutions for highly mobile, ad hoc, and time-sensitive environments. Ascom uses its unique product and solutions portfolio and software architecture capabilities to devise integration and mobilization solutions that provide truly smooth, complete and efficient workflows for healthcare as well as for industry and retail sectors.